Sunday (29/01) at 3pm at the Bijbels Museum - witness the living museum and contemporary music of the Anti-Delusion Mechanism. The living museum. Contemporary music moves the objects of Kevin Power through the Jacob de Witzaal of the Bijbels Museum in Amsterdam. A recital for 11 musicians, singers and actors. With text excerpts from the Revelation to John and other classical text-sources. A salon of tones, textures and reverberating scriptures. The recital is realized as a collaboration between violinist Jacob Plooij, visual artist Kevin Power and the performance formation Anti-Delusion Mechanism. Thomas Voorn creates colourful environmental friendly landscape pollution. 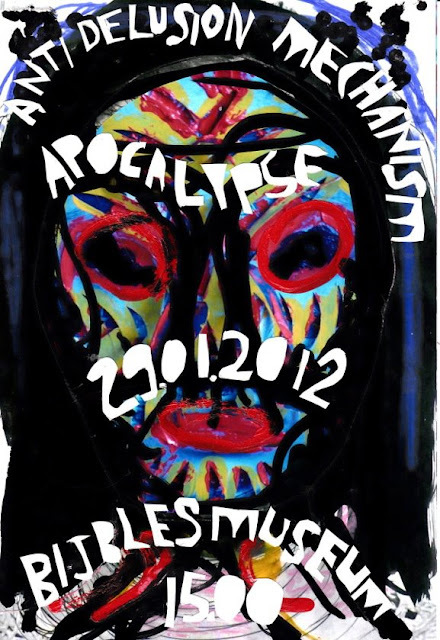 He travels around with bags full of clothes, his alphabet, to create Garment Graffiti in a typical colour range. In several photo series the garments and letters are subtly pushed to their limits. 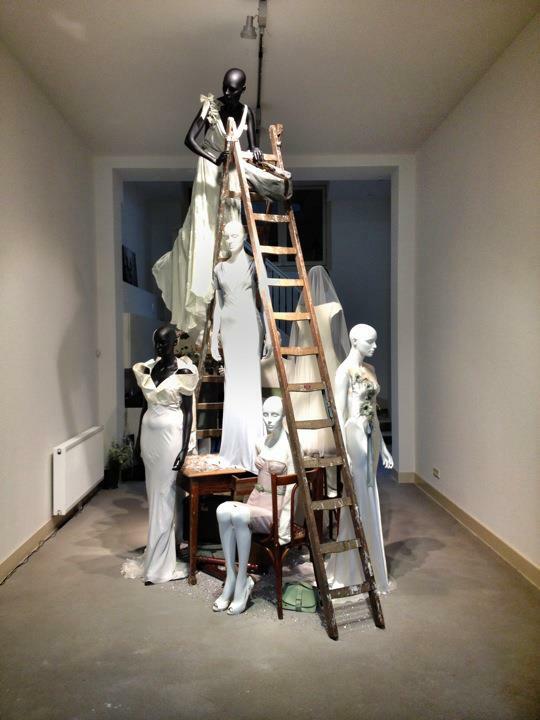 Garments are thrown into a duckweed ditch, hung up as washing in a winter forest and layed out on rooftops, creating surreal confrontations with words for a passerby. At times the garment typography appears as leftovers of a person undressed, looking for friction between clothes, text and context. Thomas Voorn developed his unique 'textile typography' in 2006, resulting in several projects and commissions. For winterSALON/2012 he creates a unique Garment Graffiti at the Bijbels Museum. Thomas Voorn (Breda, 1977) is a designer | artdirector based in Rotterdam, Holland. He works in a multidisciplinary way to create design concepts and translates these into commercial prints, products and projects for a wide range of clients. In each project he demonstrates his contemporary vision on colours, prints and products with his signature style. Looking for a contemporary clash and match of colours and prints. Pushing borders and subtly twisting reality. Thomas Voorn winks to daily life. Thomas Voorn works on commission base on design projects from his studio in Rotterdam. In the past ten years Thomas Voorn exhibited his work at Festival International des Arts de la Mode Hyeres France, Victoria & Albert Museum London, Arnhem Mode Biennale, London Fashion Week off-schedule, Tokyo Fashion Week showrooms, Crafts Council Gallery London and other (inter)-national galleries and museums. 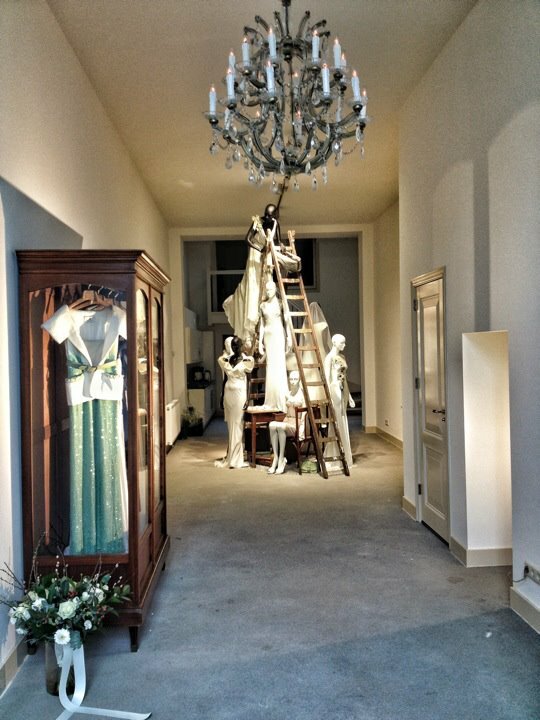 winterSALON/2012: Atelier Edwin Oudshoorn will open its doors today!